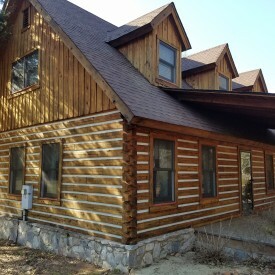 888-LOG-GUYS is your log home restoration company in the Dothan Alabama area! That’s right! We want to be yours, and we work hard to make sure our friends have a log home in excellent condition! 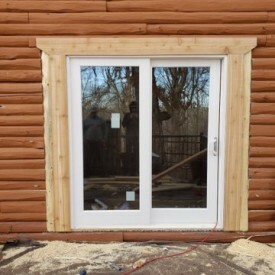 There are several different areas of log home care that we work in: log home restoration, log home repair, log home chinking and caulking, log home maintenance, and log home improvement. If you are interested in any of these services, contact us today by phone or request an estimate on our website! There is something so incredible about transforming a log home from looking dull, gray, or weathered into looking clean, bright and strong. Our restoration process starts with stripping the old stain with media blasting (corn cob, sand, glass, or walnut blasting.) Next, you have the option of sanding your logs for a smooth finish before our crew cleans your logs with a borate treatment. After that, we will apply an energy seal (chinking or caulking) in between your logs before applying the stain that will make your home look gorgeous! If you have seen that your logs are deteriorating or breaking down, you can call us! If you have noticed some logs damaged by severe weather, you can call us! If you have seen holes in your logs and you think you may have an insect infestation, you can call us! 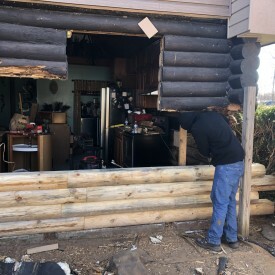 Our professional crew has repaired or replaced thousands of feet of logs, and they would also love to fix your log home in need of care, no matter what the cause of the problem! Call our toll-free number or ask for an estimate from our website! That white stuff in between your logs helps keep your log home safe, cozy, and secure. If you have noticed bugs invading your home, air drafts around your windows, or water leaks coming through your walls, then you may have some gaps in between your logs that need to be sealed. 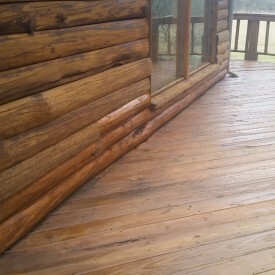 Our crew can apply chinking or caulking to any log home or log cabin, and they can even repair an energy seal that is already in place. Don’t wait any longer! Get rid of those annoyances and protect your log home with an energy seal applied by 888-LOG-GUYS! If there is something you would like to add to your home to make it more beautiful and increase its value, then start a discussion with the best log home improvement company in the Dothan AL area, 888-LOG-GUYS! We would love to talk about how we can construct a log staircase for you or build a log railing for the interior of your home. Our crew can also build decks, porches, and patios on the outside. Call us for a free estimate, or you can request a quote from our website! 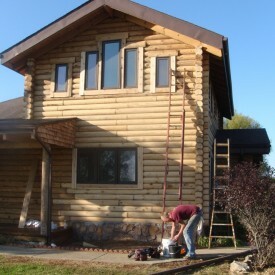 Let 888-LOG-GUYS save you time and money with our log home maintenance packages! Our company will always be there to maintain your log home’s care. Every few years, our crew will be there to clean and re-coat your log home to keep it in excellent condition. Whether you are an old friend or a new friend, it doesn’t matter! And if the unexpected happens, there is no need to stress! We are behind you to make sure your log home stays in great condition, no matter what may come! 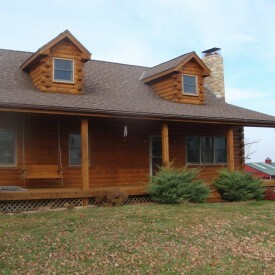 Call us today to be sure your log home is in the right hands!